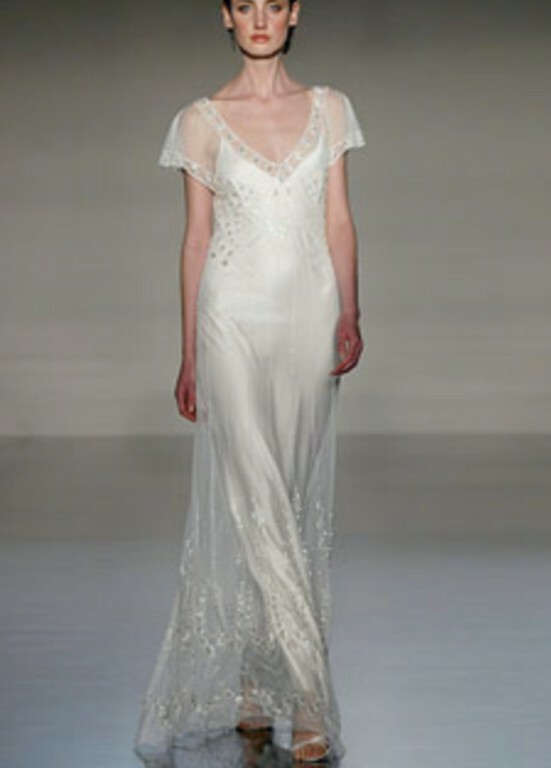 Stunning Jenny Packham 'Claire' wedding dress. It comprises a figure-hugging silk slip with spaghetti straps and a delicate tulle overlay that is hand-embroidered with intricate beading in typical Jenny Packham style. The silk slip is fully lined with silk and polyester and is very good quality...honestly the best silk i've ever worn; not at all thin and hangs in the right places. The dress is unaltered and in excellent condition. There are no tears or holes. There are a couple of barely-noticeable pulls at the bottom of the tulle overlay, and a tiny bit of bobbling to the bottom of the silk slip, but these are barely noticeable. I wore this dress just once and only for a few hours. Dress size is 12, but would look awesome on a 10. I am a size 10 (small 12), 5 ft 7" with 34 DD chest. The dress fits me perfectly and just skims the floor when wearing 2.5 inch heels. It's a very flattering dress and I received a lot of compliments when wearing this. Everyone said it was one of the most beautiful and unique wedding dresses they'd ever seen. I'm really sorry to see it go as I absolutely love it, but the time has come for us to part, and I would love for someone else to enjoy wearing this as much as I did.